I used to think design was an endpoint: a place you could hold clearly in your mind, once you had it figured out. The easy part of the job. The hard work was then finding your way to whatever it was you had designed. Farming and knitting have, between them, blown that concept clear out of the water. In the past, “designing the unexpected” would have been an oxymoron. Now it is the only way I can adequately describe the process I go through. One of my favourite pattern designers, Georgie Hallam, described her design process as beginning with the phrase, “I wonder what would happen if I…” In place of a static endpoint and a set of well-defined steps to get there, Georgie’s process opens up to curiosity, serendipity, failure, learning, timelessness—a child-like pleasure in exploring what is possible. Georgie Hallam’s design “Gidday Baby” knitted in Augustbird’s Green Tree Frog (with White Gum Wool as the base) and Sedge for baby Bo, son of friends Jules and Tom. A few months ago, I asked myself, “I wonder what would happen if I let all of my sheep live out their natural lives on the property?” It wasn’t the first time I’d had the thought, but it was the first time I got it all the way to front of my brain, prodded a bit by questions from a dear friend of mine in the US. My first reaction was, “What will I do with all the dead bodies?” Which is an interesting first reaction, but comes from the reality of how many animals are sold each year from a commercial enterprise—in my case, about 350. As I’ve let the design process unfold, though, it has become not only a manageable idea, it will have profound ramifications. I should warn you, in order to explain this well, I have to provide rather a lot of detail, which may not be interesting to everyone. So let me just say here the bottom line at this point is I’m reasonably confident I can make this work—in terms of ovine geriatrics, farm finances, and disposal of dead bodies. If you like, you can skip to the end, now, and read about the latest adventures of the swan family. Swan family in the revegetation area where they clutched. Trees in the background were all planted in 2008. If you are still with me, here we go. 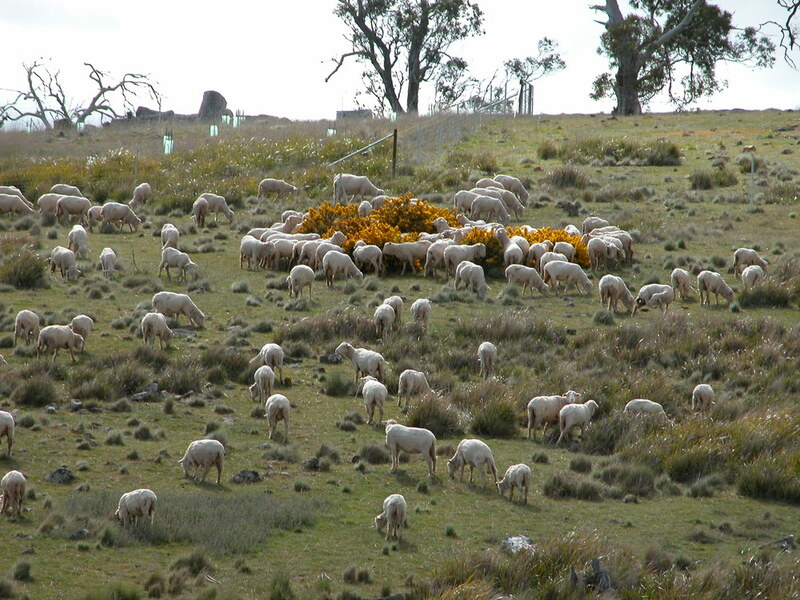 Merinos are among the longest-lived sheep breeds, with anecdotes of 16-year old ewes still producing a lamb each year (yikes). Most big commercial farms would sell ewes at 5 or 6 years of age, after 4 or 5 lambs, either to a smaller operator who might keep them for another 2 or 3 years and lambs, or for slaughter. 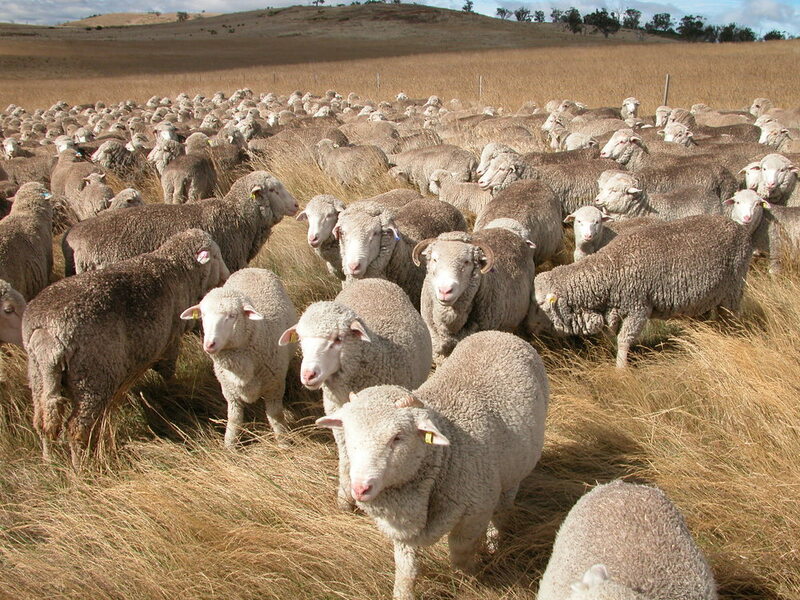 So there aren’t a lot of statistics on longevity, wool quality, health issues, etc for older sheep. Miss Clara, as usual torn between staying with me and not letting the flock get away from her. For the purposes of design, let’s assume my sheep will live happy, healthy lives to an average age of 12 years, continuing to produce good wool—an assumption borne out by Alice and Old Leader (at 10 and 9 years respectively). My flock currently numbers 1000 sheep, so, on average, I would lose 80 sheep a year to old age, and would need to lamb the same number to replace those. Lots more manageable in terms of dead bodies than 350. Youngest to oldest: pet lambs Vicky, Clara and Felix in front of Old Leader (blue ear tag) and Alice (curled horns). This was taken earlier this year, and Alice and Old Leader still look pretty much as they did 2 years ago when I took the photos that are on the yarn labels. Here are some of the unexpected ramifications. First, it’s the grown sheep who grow the wool—5 kg per animal compared to 2 kg for the babies. So, assuming wool production doesn’t decline significantly with age, I’ll be producing another 800 kg or so of wool per year with the same number of animals. I’ll make much more from the additional wool made into yarn than I would from breeding and selling another 270 sheep each year. Second, I only need each ewe to produce 2 lambs over her lifetime in order to maintain the flock numbers. Third, I can be quite choosy about which ewes I use to produce lambs, so I can improve the genetics of the flock more readily. Here’s looking at you, kid. As the dogs and I spend more time with the flock, curiosity is replacing wariness, and they often will graze up close if we are sitting still. Perhaps most importantly to me, I will be building a flock filled with canny, older, non-breeding ewes—the ones like Old Leader who help the flock thrive. Chowing down on gorse blossoms–one of the many learned eating behaviours passed down from the canny old ewes to the youngsters. In terms of lambing, the first unexpected thing was to NOT lamb this spring, because my flock is relatively young. Other than Alice and Old Leader, the oldest are only 5. Since the whole idea is to not sell any sheep, and because I didn’t want to increase the grazing pressure in what has been shaping up into an unhappily dry year, it was a no-brainer to forgo lambing. In turn, I found myself re-examining why I lamb in spring anyway—why not autumn, when the pregnant ewes have had a good summer’s nutrition, and the weather is more settled? And if I do lamb in autumn, and still shear in September, why not skip the first shearing for the babies and let them grow their fleece out for 18 months instead of 10, making a better fibre for yarn? So you see, now, what I mean by designing the unexpected. As Georgie implied, it’s critical to start with what matters to you—in my case what I think is right for the animals—and then let the creative process go where it will. he old yards lit up by a lovely double rainbow in early September. Not much rain, sadly, but a good show nonetheless. Last week I was shepherding the flock in what I call the Forest—a 12 ha (30 acre) revegetation area surrounding Swan Lake. As we came up over the dam wall at the southern end of the Forest, the sheep suddenly started turning back to me. I couldn’t see what was happening until I scrambled up the dam myself: there was Papa swan, looking like a fierce “lollipop man” at a school crossing, refusing to let 1000 sheep bully him. He held the ewes at bay while Mama shepherded her 6 kidlets to safety—rather slowly and awkwardly! The sheep, while curious, were content to stand quietly and wait for permission to proceed. If you look closely, you can see the swans moving away on the right side of the photo. I was too busy worrying about the sheep hurting the cygnets to even think about getting my proper camera out, so this is an iPhone special. And yesterday in preparation for a shepherding trek back the other direction through the Forest, I opened the gates connecting it with Willow Tree pond, about 500 m east of Swan Lake. In the 45 minutes it took me to collect up the flock, the swan family upped sticks and moved themselves to Willow Tree. I’m not exactly sure how they got through the last bit of fence, as the gate into the waterhole itself was closed, and the cygnets are way too young to fly yet. I’m guessing Mama and Papa flew over and then called the kids through the fence. Mama has always had a fondness for Willow Tree—all during incubation of the eggs, she spent her days swanning around in Willow Tree pond rather than keeping Papa company. Makes me wonder if there was a bit of a domestic argument over where to build the nest, and she lost. But it looks like she has no intention of going back west any time soon. Safe on Willow Tree pond. Phew! p.s. 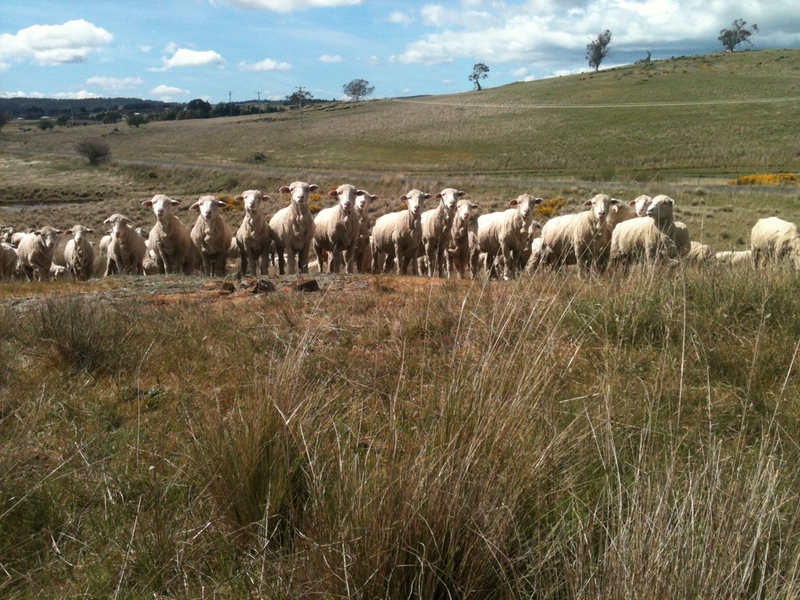 Shearing is all done for another year, hooray! The fibre looks good, is sound, and I think they grew quite a bit more of it than last year. I’ll know for sure when I see the tests. The wool is on its way to NZ for scouring and processing. 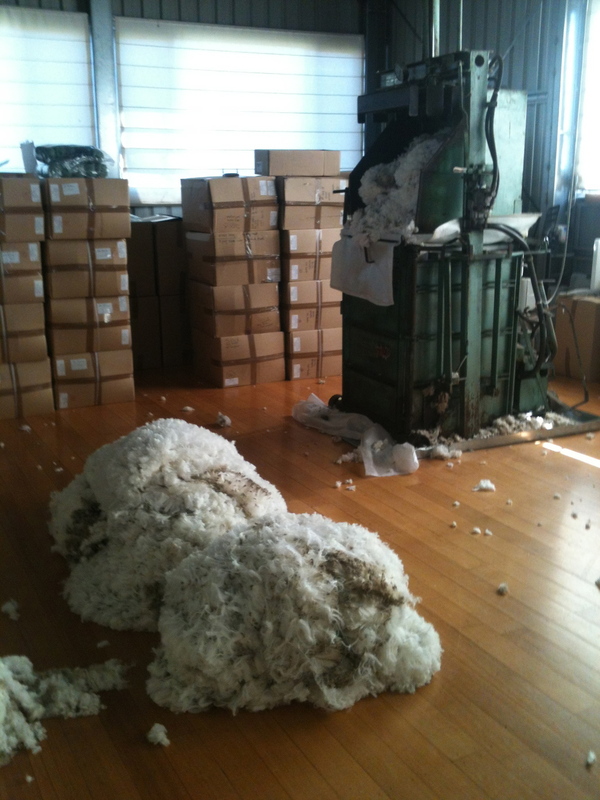 Ewe fleeces ready to go into the press, with boxes of yarn from last year’s clip in the background. p.p.s. I was remiss not to give photo credit in the last Yarn to Michel Meuret for the pictures from France—thanks again, Michel!